A fundamental factor in making models appear life size and massive is to shoot them at high camera speeds. This results in them being viewed in slow motion when projected. At normal live action speeds, say when an actor is talking, the film moves through the camera exposing 24 frames per second. If you increase the speed by 4 times to 96 frames per second, whatever takes 1 second to film will take 4 seconds to watch, thereby slowing down the action. Without this the miniature ships would bob up and down on the tiny waves in a most unconvincing fashion. This is easily demonstrable if you have a DVD player capable of faster playback speeds. Take any movie model ship scene and play it back from between 3 and 4 times fast forward and you will get an approximation of the actual speed at which the model was moving. Suddenly the true temporal scale is revealed and the enlarging effect is greatly diminished, the model looks smaller, back to the size it really is. There is an old rule of thumb that was used to determine the appropriate frame rate at which to shoot a miniature. Generally the square root of the scale denominator would be calculated and used as a multiplier to set the camera speed. For example a 1/16 scale miniature would be shot at around 96 frames per second, the square root of 16 being 4 and 4 times 24 equals 96. A larger 1/4 scale model would result in a 2 times increase to 48 frames per second. This formula was generally a good place to start and usually some testing would take place to finalise the speed setting. It follows from this that the smaller the scale the faster you need to shoot and eventually you reach the limit of what is physically possible for the camera to achieve. The reliable old work horse, the Mitchell High Speed 35mm Camera, if well maintained, was capable of speeds of up to 128 frames per second. Some of the model ship explosions for Tora Tora Tora were filmed with a camera capable of 360 frames per second, that is 15 times normal speed and about as fast as it is technically possible for an "intermittent movement" to shift the 35 mm film through the camera. There are cameras which can go faster, they generally move the film through the camera continuously, using a rotating prism to scan the image onto the film as it slides past the aperture. Speeds in the thousands of frames per second can be had here coupled to specialised lighting fixtures which synchronise to the high speed and short exposures. 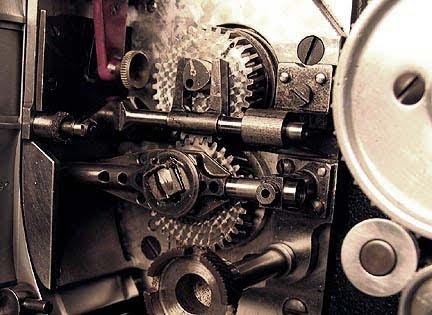 Cameras with the afore-mentioned intermittent movement produce a far steadier image as the film is held stationary by some pins whilst the frame is exposed. Once that is done, the pins are withdrawn, the film is slid to the next frame and parked for the pins to be inserted and the next frame exposed again, hence the term intermittent, it's a start stop process. It takes a fair bit of expensive precision engineering to get a mechanism that can do this start stop process at such high speeds reliably without ripping the sprocket holes in the film or folding the film up inside the camera like a concertina. Many a take has had to be re-staged because of a camera jam. It is not unusual to record destruction sequences with more than one camera to be sure of getting the shot. A second angle can always be used in the edit anyway. I have had experience of this myself when a model tanker truck I had built (for a Japanese Ultraman TV series in the late 1980's) for a sequence where it explodes, a one take shot, was only captured by the second camera. The main camera jammed as the truck detonated. 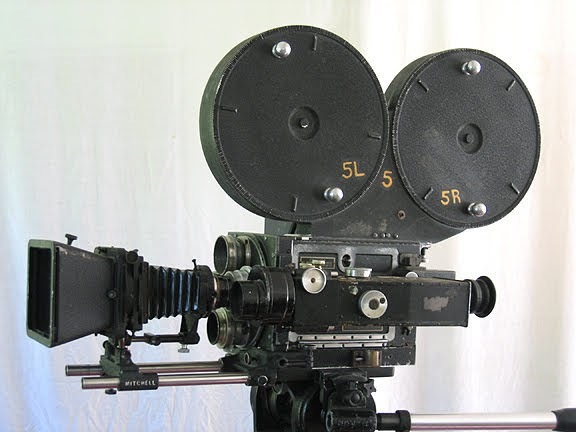 On this series we were shooting on 16mm film, a smaller and cheaper for TV format. Because the film is smaller, of less mass and a shorter distance between frames, the cameras are able to run at faster speeds. We used an Arri SR which can get up to 250 frames per second and a Photosonics Actionmaster capable of 500 frames per second. It was the latter camera which was prone to jamming but the small scale explosions (and there were many on this show) looked absolutely massive at 500 frames per second. The faster the film is transported through the camera the less time each frame is exposed to light. Higher speed shooting requires more light to get an exposure on the film. In a studio one can add to the number of lights used or use larger and more intense fixtures. One of the explosion model shoots for Ultraman, the lighting for the high speed shooting generated so much heat that the temperature on the model stage was 65 degrees celsius. We used to call the Effects Director of photography Captain Kilowatt, because of the amount of six lights ( a very bright lighting fixture consisting of 6 par bulbs in each box) he used to use. Another shoot involved using a borescope lens to shoot a miniature set at high speed. This lens is like a thin probe, usually used for inspecting into small spaces such as inside a human body for medical reasons. In this case it was used for the massively wide angle, infinite focus effect required for an orange drink commercial. The lens was particularly inefficient at transmitting light, not to mention the 2 times extender it was attached to. This meant that it took an extra 8 stops of light to get an exposure and to this was then added the extra stops of light for the high speed shooting. The hot glue used on the miniature huts to secure the thatched roofing melted. Outdoors in sunlight you might think that it would be a simple matter of just opening up the aperture of the lens. Unfortunately this would result in a shorter depth of field, rendering the extreme foreground and possibly the background "soft" or slightly out of focus. Let us examine this scenario, you are to photograph a real ship and a model of that same ship out on the ocean. The real ship in order to get all of it in frame would be some distance away. You would most likely have the lens focused at infinity. The ship, the sky and clouds in the background several kilometers away as well as the waves and the smaller model in the foreground near you, would all be in focus. If you now photograph the model so that it takes up the frame in the same way the full size ship did, you would have to be much closer to the model. Your focus setting would have to be adjusted down from infinity resulting in a shallower depth of field, causing some softening of the extreme foreground and background focus. This is another of the tell tale signs of a miniature effect. There are some amazing shots of model railroad layouts that are of a very small scale, but photographed with a pinhole camera attachment using long exposures that look pretty convincing. This is due to the ability of the pinhole to image sharp focus from the lens to infinity at the cost of low light admittance. The reverse of this effect proves the point, in the many examples of the tilt shift lens photography seen on the web, where real objects like city streets and cars are made to look like tiny toys by throwing the foreground and background out of focus, usually in combination with speeding up the action. Wide angle lenses are generally preferred over a standard or telephoto lens as they give a twofold benefit. The first is that wide angle lenses tend to exaggerate perspective which helps in making a miniature appear larger. Secondly a wide angle lens generally has a larger depth of field assisting in keeping everything from close to the front of the lens element to the far background in focus. Sometimes a longer lens is called for to simulate what you would use if you were shooting a full size ship from another ship or helicopter and you wanted to get in close. It also can compress the depth and make a stormy sea look more chaotic and dramatic. Originally movies were shot for a 1/1.33 format, that is 1 unit high by 1 and 1/3 units wide, not much more rectangular than a square. Widescreen introduced various ratios up to 1/2.66 which is 1 unit tall by 2 and 2/3's unit wide. When widescreen came into vogue, it presented problems for miniature photography. Anamorphic widescreen compresses the image horizontally using a special lens so you get a wider view than normal into the same 1.33 frame. There is a cost for this extra bit of glass and that is lower light transmission. As the aperture is opened to compensate, there is a smaller depth of field. Wider angle lenses are more difficult to make anamorphic so there tends to be only longer focal lengths available. Generally Anamorphic lenses are not able to focus as close as the traditional " spherical lens" which means you cant get as close to make your tiny model look big enough. Often the model sequences in a film would be shot spherically and optically cropped and squeezed later in an optical printer. Of course this meant throwing away the top and bottom of your film frame in the process, leaving you with less resolution (more grain) than the rest of the film. An example of this is in the movie Sink the Bismarck, one of the all time classic model ship movies. You certainly don't notice any change in resolution during the model sequences, there's too much glorious model action going on. Personally I love the look of an old anamorphic lens. There is an attraction in a widescreen composition. The lenses create a very distinctive horizontal flare (extremely popular as a digital recreation) and because of the lower depth of field give an image that soft creamy separation of subject and background, though admittedly, not good for miniatures. Another important aspect of filming is the camera position or point of view.When shooting a miniature, one way to help with realism is to think of the camera and operator as the same scale as the model. If for instance you are shooting a ship leaving the dock, your camera would probably be on a tripod roughly at eye height above the wharf. If the model was 1/24th scale and you shot a 1/24th scale model from the same position it would look like you were either on a cliff looking down or in a very stable helicopter. To achieve a comparable shot the camera would have to be 1/24th of eye height off the ground. Perhaps you do want to have a shot looking down at the ship from the air. To convince an audience that you didn't just mount a camera on a tripod and shoot a model you would need to introduce a simulation of both the motion and very subtle vibration you get from shooting from a helicopter or aircraft as you would have had to capture a real ship. A simple method of achieving a realistic pulsing vibration is to use a variable speed drill with a bent bolt in the chuck as an offset weight. The drill is strapped to a board attached to the tripod head. The drill trigger is pulsed on and off to produce a subtle cyclic vibration in the resulting footage which looks very much like that taken from a helicopter. Similarly the physics of shooting from a boat or another ship would need to be simulated to produce a realistic effect. The camera can be mounted in a box with a clear window to shoot through and floated on the water surface guided by the operator. This gives the benefit of a natural wave motion and getting the lens down as low as it can go to the surface of the water. The camera-person should always ask themselves how would I get this shot if it were real and then scale down the camera position or camera move to match the miniature. For realism, the image gathering process must be simulated as much as the image gathered. The unrealistic camera position or impossibly mobile camera move is another miniature shot giveaway.